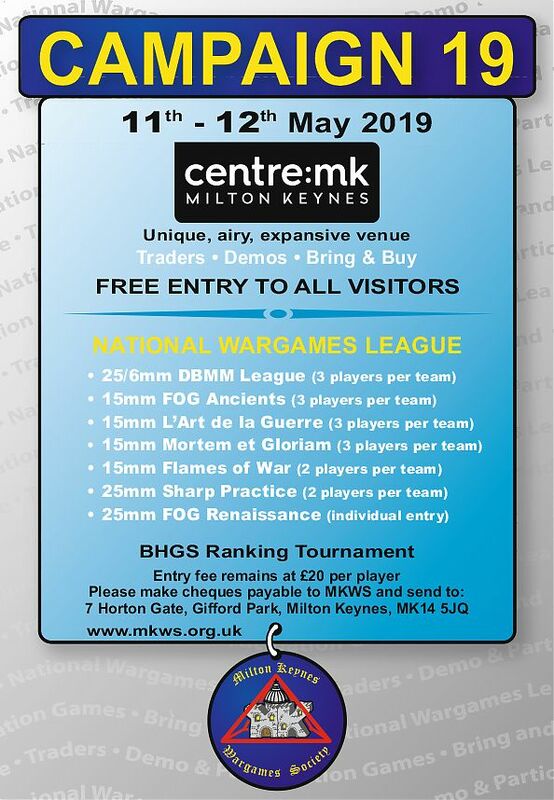 Welcome to the Milton Keynes Wargames Society web site. This web site is intended to be not only an insight into the activities of MKWS, but also to act as a catalyst to encourage newcomers to take up the hobby either with MKWS or elsewhere. In general terms most MKWS activity revolves around gaming, using representative miniatures, on either a board or tabletop. The type of game may vary between Historical, Fantasy and Science Fiction. In recent times the variety in gaming has increased significantly. No longer the sole preserve of 15mm 7th Ed. or DBM; MKWS now supports numerous periods, such as Ancients, Renaissance, Napoleonic, Colonial, WW2, Modern, Fantasy, Pirates and Bloodbowl. The list continues to grow only restricted by the imagination and enthusiasm of the members. Let me help you get the best out of our website. 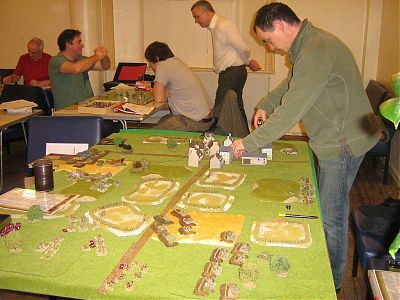 If you are interested in Milton Keynes Wargames Society, then have a look at the About Us and Meetings links. Details of the MKWS annual event Campaign can be found via the Campaign link, and National League details via the National League link. I hope that you enjoy your visit to our website, and that you will be encouraged to visit the club one evening. Sorry to keep you all waiting, but I have at last been able to update the site with the most up to date details for both Campaign 19 and the National League 2019. These are not the final details and should continue to evolve over the next few weeks. We are proud to announce that Campaign 2019 will take place on 11th – 12th May 2019, Middleton Hall, CentreMK, Milton Keynes. The details for the 2019 MKWS One-Dayer are now on site. Please follow the DBMM Tournaments link for this year’s details. Campaign 18 will be taking place over the weekend 12/13 May 2018. We will be in our usual venue, Middleton Hall, in the Milton Keynes shopping centre. You will find up to date details of both traders and clubs attending by following the Next Campaign link on this page. National League periods and tournament details will be updated as soon as they are available from the various umpires. You will find National League details by following the National League link on this page. The results of the MK One Dayer, a 15mm DBMM team event played in January, can now be found by following the DBMM tournaments link. These results include final results tables for both Teams and Individuals, along with a full set of individual games results.